Bearded is a design and web development agency that specializes in responsive content-managed websites and custom applications for the modern, multi-device web. Bearded was founded on the belief that great web design requires close collaboration between designers and developers throughout every project. We're committed to helping move the web forward, and incorporating the most successful and future-friendly technologies in our work. Bearded is located in Pittsburgh, Pennsylvania. Our designs have been featured in HOW Design’s Interactive Annual, on the Communication Arts website, in design exhibitions, as well as numerous web design galleries. Our writing about the web can be found on web design journals like A List Apart and .net magazine, as well as our own Bearded blog. The Local Initiatives Support Corporation (LISC) is a national non-profit organization that has been helping community residents transform distressed neighborhoods into healthy and sustainable communities for 30 years. Their primary initiative, Building Sustainable Communities, is a wholistic approach to the revitalization of underserved communities that includes expanding Investment in housing and other real estate, increasing family income and wealth, stimulating economic development, improving access to quality education, and supporting healthy environments and lifestyles. Bearded was approached to develop an iPad application for LISC's 30th anniversary to help tell their story through an engaging, interactive experience. We worked with our contacts at LISC to develop the concept and structure of the app, and then created a design and interface that supported the needs of LISC and the app's users. The app features a timeline of the LISC organization, expandable navigation, photo viewers with a fullscreen option, and interactive statistic panels (they flip over when tapped to reveal more information). Creating the application as a native iPad app would have caused a number of practical problems, not least among them a tight timeline and the difficulty of getting Apple App Store approval. 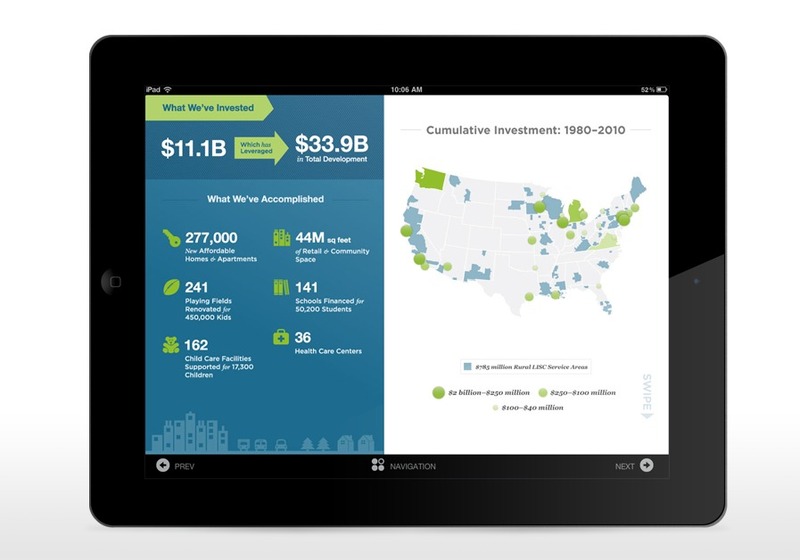 The LISC iPad application was chosen as a winner in the 14th Annual HOW Interactive Design Awards.